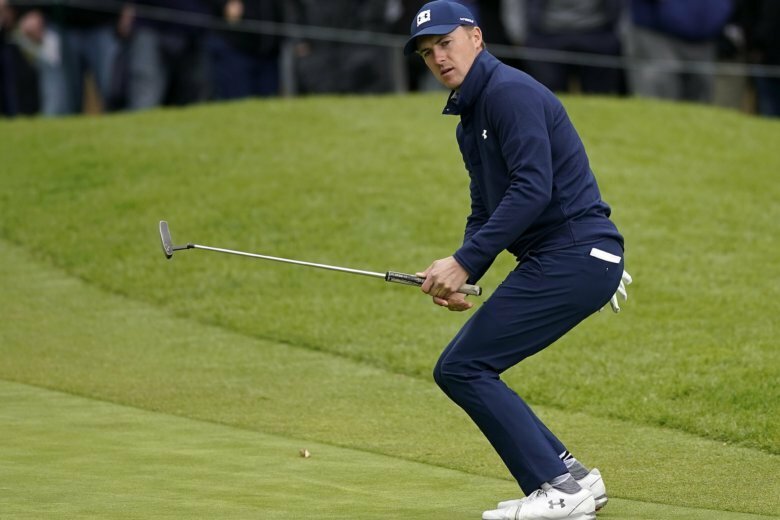 MEXICO CITY (AP) — For a brief moment, Jordan Spieth had reason to believe he finally caught a good break with a bad shot. He was trying to hit a hard, low draw on the fifth hole of the final round at Riviera into a strong wind and a light rain. Instead, it caught the heel of his 3-wood and spun out to the right, smacked off a tree and went further back next to a fence, just beyond a white out-of-bounds stake. Good news: The rules official said the stake was left there by accident. “I still made triple,” he said with a laugh. Spieth can still find humor amid the worst slump of his career, or what amounts to a slump for a 25-year-old who already has 14 victories worldwide, including three legs of the career Grand Slam. He picked up his third major in the 2017 British Open when he his tee shot caromed off a spectator’s head and into the dunes right of the 13th fairway at Royal Birkdale. He hit 3-wood after a penalty drop on the driving range, somehow escaped with bogey, and then went birdie-eagle-birdie-birdie to win. That was 37 tournaments ago, and it’s starting to feel even longer. Coming off the first winless year of his pro career, Spieth made a last-minute decision to play the Sony Open in Hawaii to shake off the rust from a busy offseason that included getting married. He missed the cut. Since then, he has opened with rounds of 65 at Torrey Pines, 66 at the AT&T Pebble Beach Pro-Am and 64 at Riviera. He has yet to break par on the weekend. His best result was a tie for 35th at Torrey. The weekends have been an issue, and Spieth said as much after he finished his first round at Riviera. Two days later, he went into the final round in a tie for fourth, eight shots behind Justin Thomas. That triple bogey on No. 5 was only part of his troubles. Just as the rain began, Spieth fanned a 4-iron on the second hole that sailed so far right that it went into the bushes high on the hill. He had to take a penalty drop and made double bogey. After the triple bogey on No. 5, his round really came unglued on the par-4 10th. He made a quadruple-bogey 8, with five of those shots from the sand. One went over the green into a plugged like near the back lip. He popped that into the middle of the sand, and his fourth shot caught too much sand and plugged under the lip. The fifth was to get back into the bottom of the bunker — plugged again — and he got that one out and two-putted for 8. The 81 matched his highest score to par, though it wasn’t all that jolting to sign his name beneath that number on his card. The results — the ultimate measure in golf — are still a work in progress. It’s one thing that Spieth is at No. 24 in the world after starting 2018 at No. 2. It’s another to realize he has played six tournaments this season and is No. 175 in the FedEx Cup standings. Perhaps most startling is how infrequently he’s even had a chance to win. In the last year, Spieth has only had three tournaments where he started the final round within five shots of the lead or closer. The most recent was at the TPC Boston, where he shot 70 and tied for 12th. It has proven to be a long road back from a year in which he struggled with his putter, and when that came around, his swing got out of sorts. Riviera was his 11th straight time out of the top 10, his longest such streak since he started in 2013. Is his patience being tested? He said at the start of the year he felt no pressure to get his game turned around quickly. He was more concerned last year when something was off in his game and he wasn’t quite sure what it was. “That’s not an easy feeling,” he said. For five years, he did a lot right without really knowing why. And when it stopped, he had to figure it out.